Series: So far, only the three reviewed here. Tug the Pup and his friends (Big Pig, Nat the Cat, and Pen Hen) have a variety of adventures ranging from what they like to do each day to catching fireflies to having a birthday party in the first box set. Each book is numbered and if a child were to read them in order, they get progressively harder. Book one has sentences like “Big Pig can jump.”; book five has “This is Little Blue Farm.”; and book ten has “Zzzzz. Pen Hen is taking a nap.” The first four books each contain six simple sentences, while the later books range from eleven to sixteen sentences. (And yes, I am counting “Zzzzz.” as a sentence since it contains a period. In Box Set 2, there is an excellent book that talks specifically about rhyming: “Book 3: Rhyme Time” — that’s a great thing for children learning to read to practice. By the end of Box Set 2, Tug the Pup has gained a new friend, Sally the Snake. Book eleven has the highest sentence count at seventeen sentences and things are getting more complex with dialogue between the characters and higher difficulty in words. 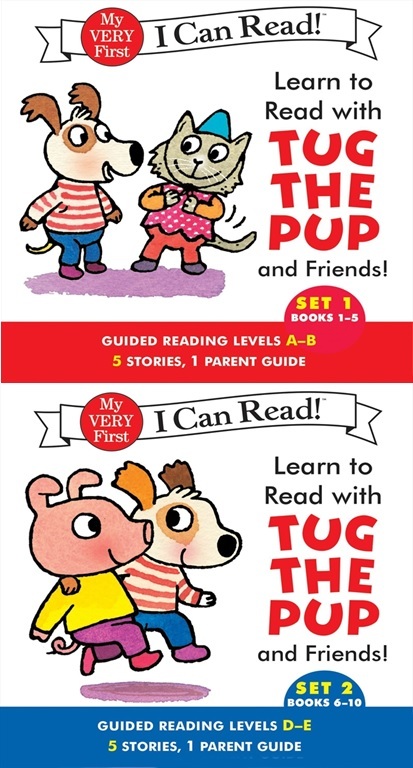 In Box Set 3, Tug the Pup has even more friends in these books: Crab, Dotty Duck, Sly Fox, Scram the Skunk, etc. Book eleven has the highest sentence count at thirty-two sentences, with a lot of complex dialogue and difficulty. At this point, the text has almost out-grown the tiny pages! These books are a great addition to the beginning reader field. What makes these books special in my opinion are the parent guides (book twelve in each set). They have information on Common Core Standards, which I know is a great help to many of my patron parents. Also to note: the guide contains activities to complete before, during, and after reading. A cute incentive for parents who will be buying these books — they also have stickers inside to place in each book once the reader has mastered it. I took those out in the library’s editions. All in all, I give Tug the Pup two very enthusiastic thumbs up! Highly recommended. Hi! We generally don’t purchase books that are paperback for this collection. I’m thinking about hole punching the books in this series and putting them in a book-on-cd case to keep them safe instead. Do you have any suggestions on what to do when a really good reader only comes in paperback? Our amazing Technical Services team covered each paperback, numbers it, and re-enforces the boxes. They started doing this with the infamous Bob books and I’ve only had to replace one since starting here over a year ago. We do circulate them as a set. I have heard that hole punching and circulating as a kit works really well too!